I think there's a bunch of great ideas in this quick interview with David Lipman. WWD: What role does technology play in marketing? D.L. : You can’t market or communicate without it. But many people in the fashion world don’t understand how to embrace it and apply it to everyday life. High-tech mobile devices and the Internet are a part of our daily lives now. if you can’t communicate and market online yet, you’re missing out. Those little things that fit in our handbags or pockets are a new weapon, and that’s where I see the biggest opportunity. WWD: Who are new players in the market? D.L. : RueLaLa, a shopping Web site, has product that sells out at lightning-bolt speed. Firms like Amazon changed the way we shop for and wear apparel. Fifteen years ago, where was Google in our lives? Today, how many times a day do you say, “Go Google this, or Google that.” There is so much exciting new technology out there that is mind-boggling. By 2015, we’re going to be in a touch-screen world. WWD: What consumer trends will develop? D.L. : The next thing will be betterment of our lives — better air, better food, better water….Think about Whole Foods, the hybrid car, the battery-operated car, solar energy, organic this, organic that….People want healthier and better lives, to live longer, and that is going to be the next wave of consumerism, with clean tech and green tech. Agate sliced jewelry layout in the May issue of O Magazine. Did you ever think it would be high fashion/in again? Inspired by Mother Earth - Los Angeles Times. "Authentic more natural stones are the 'new bling,' " says Julie Gilhart, senior vice president and fashion director of Barneys New York. "There is a handmade craft and artisanal feel to them, which feels fresh and new." Devon Leigh earrings, $395 at www.devonleigh.com. Erickson Beamon necklace, $778 at Curve, Los Angeles; Irene Neuwirth necklace, $34,340 at Barneys New York, Beverly Hills; Manu rings, $175 each at Barneys Co-Op. Seriously, I was going into withdrawal. I know all this frugality is good for us -- I'm reusing, repurposing, recycling. But a gal's gotta get some eye candy some time! The new issue of Elle arrived yesterday and there was jewelry to be seen throughout. Oh how I missed my frivolity and jewelicious pages. There was jewelry featured in at least three sections of the Fashion News department. And jewelry in the fashion spreads. And a goodly amount of jewelry ads. An interesting trend was highlighted -- agate geode slices. In multiples for the neck and wrist. Big, heavy and often dyed crystally slices. Not normally on my IN list but in these dark times, even they lightened my mood. Do you find the trend a bit funky? Or fabulous? I think I've gone to two too many Tucson gem shows to really appreciate this as a high-fashion look. But they're inexpensive and eyecatching and well, frankly, quite fun. So, I vote for the slices. In any color. It wasn't all doom at the NY International Gift Show this week at the Javits Center. While recent reports from a lot trade shows were depressing more people I spoke to yesterday were pleasantly surprised. Perhaps expectations were set SO low that any news was good news but still and all, I spoke with designers who see this as a time for the good guys to "hold on" and treat their customers well and make smart, conservative choices in their business management. Odd statement for "artists" to make, huh? But these were sound, rational unpanicked conversations. Now don't get me wrong, no one was whooping it up but they weren't crying in their beers, either. The retailers that attended (while small in number) seemed cautious but resigned to waiting it out. They expected to still be here in a year. Tell us your biggest conundrum, share with us a current challenge, ask us your big question and we'll use the questions posted here in comments during our new teleconference series. We'll be talking with our Advisors, some famous designers and a host of other experts and we'll ask them YOUR questions. No guarantees we'll get to all nor that we'll go in any particular order but... the goal is definitely to be tidy and complete! I've been talking about chocolate gold for a year now -- seeing it in more European lines like the luscious Mattioli brand from Italy (gorgeous designs!!!). And of course, designers are asking where can they get it. So I made a few calls to United Precious Metals & David H. Fell (where you can buy all colors of gold) and to the U.S. office of Mattioli and confirmed that it is NOT an alloy but a surface treatment. It's a very high tech metallurgic magic (PVD or physical vapor deposition) that turns titanium a rich chocolate color (actually can turn it lots of different colors) that is added to a gold design. 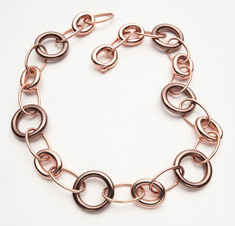 In a related color story we saw bronze alloys in play this past fine jewelry market. Similar warm tones but way cheaper material. Think fine jewelers will go for this? I met with a reporter for The Epoch Times during the JA New York Show and we talked trends for quite a while. "According to Cindy Edelstein from the Jewelry Resource, the trends that we see today are mimicked throughout the industry. Designs are using different textures, mixing different metals, and presenting new stones. Hoops are popular, earrings are getting bigger, and bangles and cuffs are a must. Stack rings are still going strong, but this is the year of the cuff! For a while jewelry was tiny, but now it is scaling up. Wear an armload of bangles or a big cuff. Add movement—wear a waterfall on the ear rather than a shield."